Stay and die, or run and survive. Twins Virginia and Tommy Matthews have been on their own since they were orphaned at the age of five, surviving a merciless foster care system by relying on each other. Twelve years later, the world begins to collapse around them as a deadly contagion steadily wipes out entire populations and a devastating world war rages on. When Tommy is drafted for the war, the twins are faced with a choice: accept their fate of almost certain death, or dodge the draft. Virginia and Tommy flee into the dark night. Armed with only a pistol and their fierce will to survive, the twins set forth in search of a new beginning. Encountering a colorful cast of characters along the way, Tommy and Virginia must navigate the dangers and wonders of this changed world as they try to outrun the demons of their past. 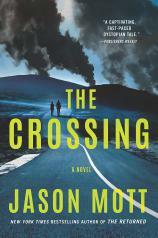 With deft imagination and breathless prose, THE CROSSING is a riveting tale of loyalty, sacrifice and the burdens we carry with us into the darkness of the unknown.